Zika virus was on everybody’s mind at ICID and there were a lot of very insightful presentations from those who are dealing with the current situation in Brazil. Firstly, it is important to acknowledge that, just like MERS-CoV, Zika has been around for longer than most people think. It was originally discovered in the Zika Forest of Uganda in 1947 in a sentinel Rhesus monkey. The following year, it was found in Aedes africanus mosquitoes. It was not until 1952 that the first human cases emerged. In the 60 years since its discovery, evidence was found showing that Zika was distributed throughout West Africa and Asia (India, Indonesia, Malaysia, Pakistan). Further analysis of the virus differentiated three different strains: East African, West African and Asian. During that time, few cases had been identified, however, scientists recognized early on the difficulties in differentiating Zika from other similar viruses such as chikungunya or dengue fever. In general, symptoms of Zika have been mild, including fever, skin rash, arthropathy and conjunctivitis. The first outbreak that put Zika on the map startedin 2013 in several islands of the Pacific, including French Polynesia. More serious complications from infection with the virus were noted, such as neurologic symptoms, Guillain-Barré syndrome and possible congenital malformations. Not long after, in Spring of 2014, increased cases of rashes started appearing in Brazil. Zika was not on the list of potential causes, because many local diseases cause similar clinical appearance (such as dengue and chikungunya). To complicate things, several of the affected patients tested positive for dengue. Over time, it became apparent that people affected were not showing all the classical signs of dengue. A couple of months into the outbreak authorities began to look elsewhere to explain what was happening in Brazil – and Zika was found. This was the first time the virus was identified in the Americas. The situation in Brazil revealed a concerning new development. In areas where Zika was spreading, mothers started giving birth to children with microcephaly. Much discussion has been made about the link between Zika virus infection and microcephaly. Some have claimed that the congenital abnormalities could have been caused by something else, such as a specific pesticide that was used around the same time microcephaly clusters appeared. Our speakers at the conference seemed to challenge that idea, as microcephaly cases were seen in areas where the pesticide was not present. In addition, more research into the issue revealed the presence of Zika virus in the brains of newborn with microcephaly. In fact, looking back to the 2014 outbreak in French Polynesia showed that similar congenital abnormalities likely occurred as well. Some have also put forth the idea that the strain involved in the Brazil outbreak is related to the one from French Polynesia. Currently, the Zika outbreak that started in Brazil has spread to other countries of Latin America and the Caribbean. So why is Zika changing all of the sudden? How did this new feature of microcephaly appear? The epidemiologic triad can help elucidate part of these questions. The triad describes three major components of a disease: the agent (pathogen), the host or the environment. Any alteration to these three pillars can change the epidemiology and characteristics of an illness. The pathogen. We knew that Zika already could affect the neurological system of newborn from the 2014 outbreak in French Polynesia. It is possible that, through natural mutations, the virus acquired genes that made it more efficient at infecting the foetal brain, leading to an increased rate of microcephaly. The host. Because Zika has been around for decades in Africa and Asia, populations in these areas have already been exposed to the virus and developed an efficient immune response to it. In other parts of the world however, humans and animals have never been infected with the disease and are thus, not protected (i.e. naïve). In the case of Zika in Latin America, the disease may cause more severe symptoms after infection because the local populations are naïve. This has been seen with the spread of another mosquito-borne disease into the Americas: West Nile virus. The environment. Spreading into a new environment can shift a particular disease’s ecology. In Latin America, different species of mosquitoes may be more efficient at spreading Zika. The virus may also infect different species of animals where it can multiply at a faster rate than in other parts of the world. Any part of the epidemiologic triad can help explain why Zika behaves differently in Brazil compared to other countries where it has been present for a while. It is likely that all three components of the triad play a part in the fast spread of Zika through the Americas. One of first challenges in identifying the Zika outbreak in Brazil was the fact that the disease shares many similarities to other illnesses commonly seen in that part of the world, such as dengue and chikungunya. Many symptoms overlap between these three viruses, such as rash, headache, fever or conjunctivitis. Physicians have to look at them very closely to be able to start differentiating these diseases clinically. To complicate things, dengue and chikungunya are spread by some of the same mosquitoes that transmit Zika (Aedes aegypti and A. albopictus) and it is likely that people become infected by more than one virus. Finally, both dengue and Zika both belong to the same family (Flaviviruses), which means their genetic code is closely related and few diagnostic tests can differentiate them (until now, tests that could tell Zika and dengue apart were not in high demand). Has there been any deaths? Of all three diseases, dengue is the deadliest. If death is not a prominent feature of an outbreak, then dengue is the least likely culprit. Is there any fever? Dengue can cause moderate fever; chikungunya is usually characterized by high fever. In Zika, fever may be absent. Is there any rash? In the case of dengue, a rash usually appears at 7 days after infection, whereas a rash from Zika usually appears within 2-3 days. In addition, these rashes can be more severe, very pruritic and non-responsive to medications. What are the characteristics of the pain experienced by the patient? All three diseases can cause headache and joint pain. However, with dengue, joint pain is usually present during episodes of fever. Chikungunya can cause a very severe and debilitating joint pain compared to Zika, where pain is more limited and cyclical. Is there edema? Edema from Zika virus is usually cold (i.e. not related to inflammation). Is there conjunctivitis? Patients infected with Zika virus often have conjunctivitis. Chikungunya causes occasional conjunctivitis, while this symptom is not usually a feature of dengue. Is there bleeding? Dengue can cause a hemorrhagic syndrome while the other two viruses don’t. Zika has been around for more than 60 years and barely made the news until now, mostly because of the newly recognized effect of microcephaly. Unfortunately, along with the increased coverage can come many misconceptions. Zika is serious, but it is rarely fatal. In comparison, dengue is deadlier, and chikungunya can cause long-lasting debilitating joint illness. In fact, the mild nature of Zika, coupled with its congenital effects is the most concerning aspect of the disease. Many people may not be aware they are infected and could pass on the virus to their unborn child. The lesson to learn from this current outbreak is that mosquitoes be vectors for several serious diseases. These include Zika, dengue, chikungunya discussed in this post, but also yellow fever, West Nile virus, malaria and more. Because of pressures to the pathogen, host, or environment, it is likely that these diseases will continue to change. While today we focus on Zika, tomorrow’s mediatized disease may be yellow fever, or even a new emerging disease. Regardless of the disease in the spotlight – recommendations have always remained the same: mosquito control to prevent bites. This will decrease the likelihoods of infection from Zika, dengue, chikungunya or any mosquito-borne disease that we don’t know exists yet. I just came back from a very interesting conference in Hyderabad, India. The International Congress on Infectious Diseases (ICID) was held between March 2nd & 3rd, 2016. As usual, there were a lot of great talks, discussions and posters. Due to its location, a large number of representatives from Asian countries were presenting – it was nice to see new faces and learn about global health in that part of the world (plus it was my first time in India – so there’s another benefit…). Conferences are always a good opportunity to get up-to-date information on disease situations from the experts who are on the frontlines. The Middle Eastern Respiratory Syndrome Coronavirus (MERS-CoV) and Zika virus aretwo interesting situations to compare and contrast. I’ve talked about MERS-CoV in the past, responsible for an outbreak since 2013, and Zika has been the source of much attention lately. Because these topics generate much discussion, I’ve broken down my notes from ICID into two posts (look at that, 2 posts for the price of one!) – the 1st one focusing on MERS-CoV and other interesting aspects of the conference, and the 2nd one exclusively about Zika virus (but I’ll also sprinkle some other mosquito-borne diseases here and there…). This is an emerging disease that appeared in the Arabian Peninsula in 2012 which causes acute respiratory disease in those affected. Since then, it has spread to other countries, mostly through movement of travelers who became infected in places where the disease is prevalent. Few local clusters of infections were then seen in the destination countries, most often associated to nosocomial (hospital-acquired) infections. Because of this, it was thought that the “superspreading” potential of this disease was limited. In 2015, a large outbreak of MERS-CoV in South Korea challenged that idea. The index case was an infected traveler who flew from Saudi Arabia to South Korea. The individual became ill and was hospitalized in Seoul, the infection spread to 186 people – the largest number of MERS-CoV cases outside of the Arabian Peninsula. Because of the robust video surveillance used in the affected hospital, it was possible to have a close look at the risk factors for disease transmission from contact with an infected person. It was determined that a 10-minute stay within 5 feet (1.5 meters) and 2minute talk with an infected person had the potential to spread the disease. This estimate shows that MERS-CoV could potentially be more transmissible than initially thought. Another interesting discussion around this disease revolves around its origin. The search for the animal origin of MERS-CoV continues and a lot of attention has been put on camels as a potential source of infection in humans. Our speaker supported the idea that, while they can transmit the virus to humans, both camels and people get infected from another animal source – most likely bats. This was supported by the fact that only 1/3rd of human cases had contact with camels. Interesting research has been done on the disease in camels and it was found that camels in many countries had positive antibodies to MERS-CoV and, and were thus exposed to the virus at one point in their life – the geographic range of these positive antibiodies is well beyond the region where MERS-CoV occurs in people. Another highlight is that camel serum from the Kingdom of Saudi Arabia which was frozen in 1985 tested positive for MERS-CoV antibodies. This shows that, although spillover into human populations seems like a somewhat recent event, the virus has been in circulation in animal populations for some time. Parts of the virus were also found in a bat, however, the specimen was damaged during transport so the search for the definitive animal reservoir continues. This may take some time; after all it was only in 2013 (11 years after the Severe Acute Respiratory Syndrome (SARS) outbreak) that researchers found evidence of that virus in bats. A person who is not symptomatic for MERS-CoV is not infectious to others. About 25% of infected people may be asymptomatic (this is an estimate as those who are not sick don’t tend to go to the hospital – where the diagnosis can be made). A visibly sick patient can spread the virus for up to 30 days. A human who recovered from the disease will have positive antibodies for up to 3 months – after which serologic testing may be negative. This complicates historical investigation of the disease in humans since antibodies are so short-lived. Most nurses who became infected in Saudi Arabia from their patients were involved in intubation procedures of infected patients. Cleaning is key – in hospital settings, the virus was found on surfaces about 28 days after the patient recovered. It is unknown if dogs and cats can become infected with MERS-CoV. Although not a specifically “One Health-oriented” conference, One Health is always around. This was evident as a lot of presentations discussed the relationships between humans, animals and their shared environment, especially when it comes to infectious diseases. Leptospirosis challenges in India. In India, whenever there are cattle, rats and children in the same environment, then leptospirosis is usually present. Leptospirosis is a bacterial disease that usually infects its hosts through contact with mucous membranes (gums, conjunctiva) or open wounds. Infection with the bacteria can lead to severe liver disease. It was interesting to learn about the local epidemiology of the disease, as well as get examples of potential simple interventions that can help reduce cases of the disease in children, such as wearing long shoes. The speaker also covered some of the challenges in creating a vaccine for the disease that cover all serotypes of Leptospira bacteria, and mentioned hopes that a DNA-based vaccine may provide more coverage. Integrated human and animal vaccinations in Nigeria. A very interesting presentation described efforts to jointly vaccinate people and livestock in pastoralist communities of Nigeria using multi-disciplinary teams. The speaker went on to say that the communities were very responsive to the program and that the group is looking to publish about their experiences soon. This presentation was truly a great example of One Health in action, leveraging the relationships between humans and livestock to improve health on both ends. Dog bites to humans and animals. This poster measured the impact of dog bites on both humans and other animals in a region of India. Emphasis was on the rabies risk for both people and animals after they were bitten by stray dogs in an area endemic for canine rabies – and the cost associated with treatment of those affected. This is leading the government of India to recognize the need for surgical spay/neuter of stray dog populations as an integral part of canine rabies control. This about wraps it up for part one of my ICID report – I will upload part two in the next few days. This was my first time in India so I had to see more of this beautiful country. Sunset on the Ganges. Before starting any health intervention, one of the most important things to do is to figure out if an intervention is needed at all and if so, what it should focus on. Part of that comes from doing a needs assessment. Looking through a broad lens – we may come to understand a lot about a specific health issue (e.g. how a disease is maintained in the environment, what are symptoms, etc.). However, all this knowledge may be useless if we cannot implement interventions that will work at a local level. 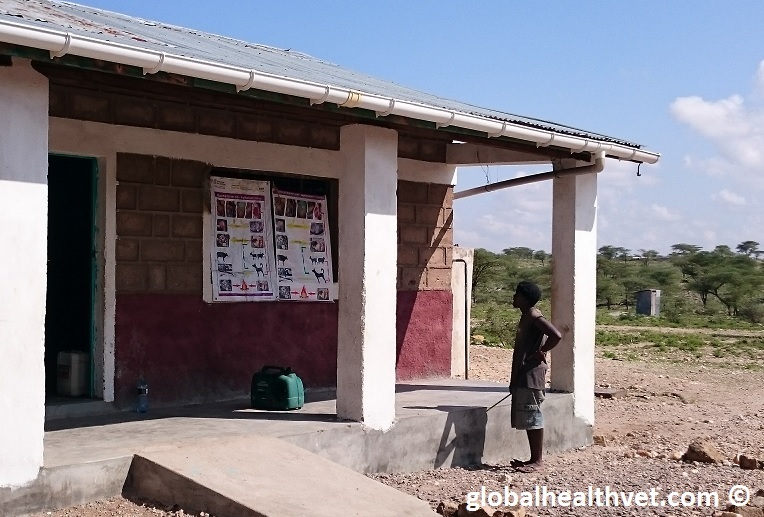 Last December, I had the opportunity participate in a needs assessment activity in Kenya, which was a great way to learn more about One Health in East Africa. Refining the problem. As much as possible, a needs assessment must be done locally. This is the opportunity to understand how local culture relate to the issue at hand. It can help identify additional risk factors as well as a specific group of people who are most affected by the problem. Eventually, it will feed into intervention-based projects to ensure that we don’t “miss the target” and truly use resources where needed. What does the affected population perceive as health concerns? Should we be focusing on a different problem? What interventions have failed to promote change in the past? Why did they not succeed? What are barriers to enacting interventions? These may be cultural, logistical, political or more. What could be solutions to overcome these barriers? What are best ways to successfully convey health messages or education to local population (e.g. radio, town meetings, flyer or other activity) and who should receive those messages? A Knowledge Attitude Practice (KAP) survey is a great tool to get some of the answers above. Identifying local partners and stakeholders. Chances are, other organizations are working on similar issues. They may be local government, non-profits and/or international organizations. Finding what others are doing in regards to a specific problem is essential to making sure that there is no duplication of efforts. Improving global health should be done through a collaborative process, rather than multiple organizations working on their own. In addition, identifying local leaders who will be on board with proposed interventions is crucial to the success of a health campaign. There is obviously much more to needs assessments and the parts described above are my take on what are its most essential aspects. Other resources exist that describe this process in much more detail and I encourage the reader to do their own research. I have included some additional resources at the end of this post. Our first step in Kenya was to meet local organizations. They included the Faculty of Veterinary Medicine at the University of Nairobi, the OIE Sub-Regional Office for East Africa, government veterinarians, representative from SIDAI – a local veterinary service provider –, and the Meru University of Science and Technology (MUST), our main host for the trip. Through our discussions with stakeholders, we got a better insight of local One Health efforts and our meetings with these groups focused our project ideas. With our colleagues from MUST, we then started our field visits to understand the roles of animals in Kenya and the challenges related to human-animal-environment interactions. Site visits included: dairy farms, slaughterhouses, local villages and more. Kenya is very diverse, both in its geographical landscape and richness of cultures. It was evident that people’s interactions with animals were vastly differed based on location and predominant culture represented. For example, in the green hills of tea-producing Meru County, dairy farming is predominant. Just over an hour away, in the dryer Samburu County, pastoralism is more common. The challenges in each therefore reflect their local environment and practices. For example, pastoralist communities may travel over large distances during the year, looking for grazing areas for their herds (mostly small ruminants and cattle), whereas the dairy farmers we visited were more established. In an area where people’s livelihoods are intricately linked to animals, a One Health perspective is essential to understanding current health issues – and prepare for future ones. This was evident as the concerns over the upcoming El Niño were high, especially in the dry Samburu region. Pastoralists were worried about the environmental impact of the weather phenomenon and whether it will bring more drought to the region. larger towns with health centers and, in case of emergencies (such as complications from pregnancy), people may have to walk for several days before getting to a place where they can be treated. The same goes of animal health; a disease outbreak affecting livestock can potentially devastate a herd (and people’s livelihoods) before it can be managed. Finally, it was interesting to notice that, in most of the slaughterhouses we visited, there was good knowledge of what carcasses should be condemnable (i.e. not fit for human consumption due to likely infection with zoonotic pathogens). Specific understanding about how zoonotic diseases infect humans was not as common however. This is not unexpected, however recognizing disease is only one aspect of efficient disease prevention. To truly reduce the impact of zoonoses, a basic understanding of their life cycle is essential. This may be an area of emphasis for future educational messages. We learned a lot more from our visit and contact with local communities, which enabled us to further define our future projects. We hope that through our needs assessment exercise, we will be able to enact culturally relevant and long-lasting interventions. Thanks to all the staff at MUST for making this trip awesome! Hope to see you all again soon! 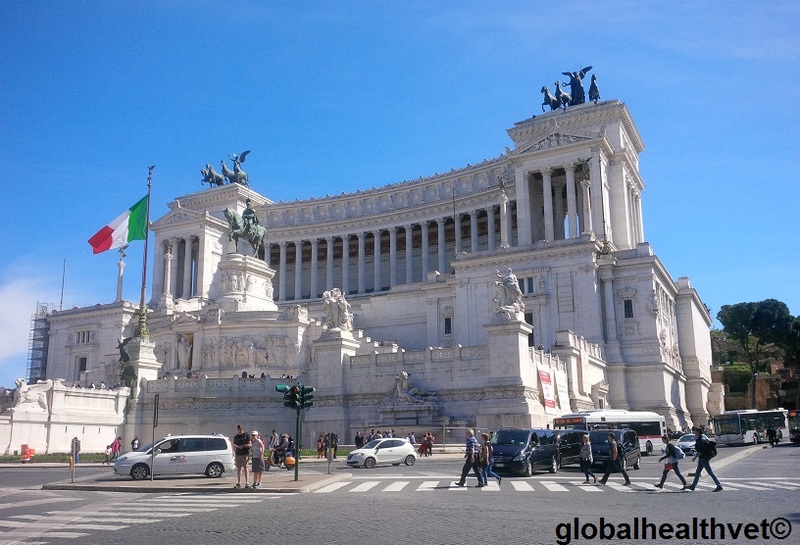 After attending the One Health Congress, I had the opportunity to stay in Europe to participate in a program called Engaging Intergovernmental Organizations (EIO). This is a course organized by the University of Minnesota where participants visit international organizations promoting global health. These organizations have all recognized the need for inter-professional collaboration for years (even before the term “One Health” was coined). The first place visited was the OIE, based in Paris. This is the organization that represents animal health globally and is also one of the smallest of all the group visited, with about 100 employees at their headquarters. 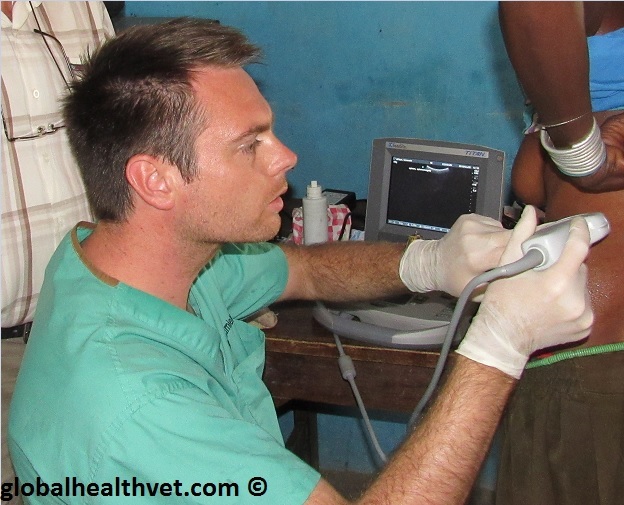 Nevertheless, they are able to promote animal health and veterinary services worldwide through a variety of projects. 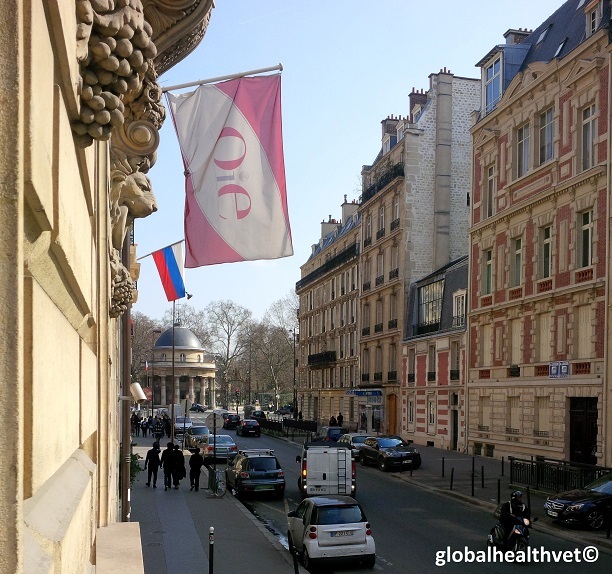 The main work of OIE is to establish international standards on many aspects of animal health such as trade, animal diseases and diagnostics, animal welfare and more. These standards are referenced by a variety of national and international entities when policies are developed. Through their World Animal Health Information System (WAHIS), the OIE monitors the global distribution of animal diseases, and keeps track of any outbreaks – which includes identifying false rumors of diseases (about 1 false rumor per month). One part of tracking disease worldwide is finding a consistent way to diagnose infections regardless of where in the world they pop up. This is done through establishing a network of national laboratories in many parts of the world that will use the same standards and protocols for animal disease diagnostics. Another objective of the OIE is the improvement of veterinary services worldwide. To this end, the organization has set up the OIE PVS Pathways, which have several components that help countries develop their veterinary services in a sustainable way. OIE also improves veterinarians’ skills at the education level, through their Day 1 Competencies – which define the skills that every veterinarian should have at graduation from veterinary school. Finally, the organization organizes twinning programs between different veterinary universities, where students can experience the challenges and benefits of learning veterinary medicine in a different part of the world. For the smallest of all organizations visited, the OIE does a remarkable job with a lot of diverse components and I can’t possibly list them all in one post. I invite you to check out their website to learn about their work in more detail. The WHO is perhaps the most well-known of the organizations. Their aim is to improve health for all people globally. Specific focus areas that are part of WHO’s work include: non-communicable and communicable diseases, and emergency preparedness, surveillance and response. As the EIO group was primarily composed of veterinarians and others working in the field of foodborne diseases, our main interests were the area of zoonoses and food safety. Speakers from WHO introduced me to the International Food Safety Authorities Network (INFOSAN). It provides public health professionals throughout the world with a forum where information about foodborne outbreaks can be shared in a fast and efficient manner. As populations rely more and more on a global food system, INFOSAN helps authorities respond rapidly to any international food-borne disease outbreak (about 40-50 outbreaks are recorded by INFOSAN each year). Other speakers presented about the work done with neglected tropical diseases. There are 17 neglected tropical diseases (NTDs) that WHO identified worldwide, and the majority of them are zoonotic. These are infectious agents that we know a lot about about, including how they are transmitted or what symptoms they cause. In addition, most of these have efficacious treatment or prevention techniques. In other words, these diseases should not be causing much of a problem in the world. They remain however a big cause of mortality and/or morbidity, especially in developing countries. WHO recognizes that these 17 diseases still constitute a threat in 149 countries, affecting 1.4 billion people globally (for example – about 30% of all seizures in Africa are caused by zoonotic tapeworm Taenia solium). As one speaker mentioned, it’s actually not the disease itself that is neglected, but the communities they affect (there is a strong correlation between NTDs and poverty). WHO established a roadmap that outlines their work to s towards the eradication of NTDs in affected populations. 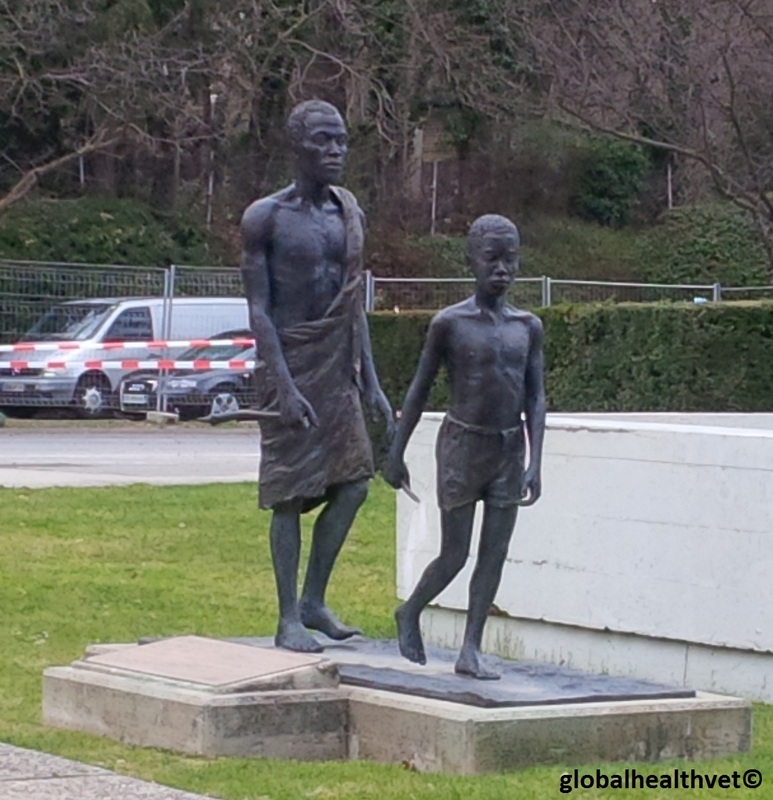 Statue commemorating river blindness (onchocerciasis) in front of WHO. The statue depicts a child leading a blind man affected by the disease. At first, I wasn’t super-excited about visiting WTO (economics and trade are not my favorite subjects…), maybe because I didn’t seem too veterinary or public health-oriented, and I didn’t know much about the organization to start with. Well…the visit to the WTO turned out to be one of the highlight of the trip. Basically, the WTO is a forum in which member countries can discuss and (hopefully) settle trade disputes between each other. There are a number of trade agreements that members of WTO sign and follow. During our visit, we focused on trade under the sanitary and phytosanitary measures (SPS). A full text of the SPS measure is available here. The SPS is an agreement signed by all member countries which describes how any trade of animals, animal products, plants and other foods should be conducted. This protects countries from importing goods that may endanger the local economy, environment, or public health. For example, a country that is free of foot and mouth disease (FMD) will have trade restrictions that let them trade beef from FMD-free countries only. The role of the WTO is to help find the balance between protecting consumers of a country while promoting fair trade. To settle disputes related to human, plant and animal health, countries rely primarily on the standards set by OIE, WHO or FAO that outline proper disease control efforts (in the case of FMD for example) or food safety practices (such as the Codex Alimentarius – see below). 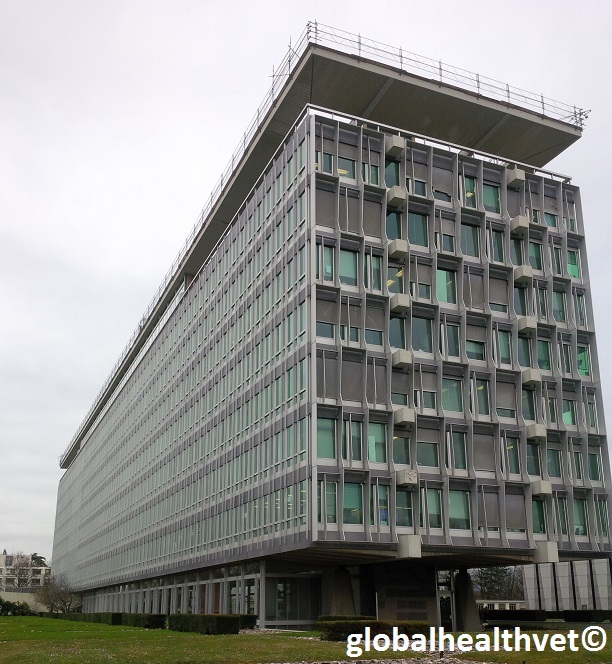 This is One Health in action and by the end of my trip to the WTO, I was able to better understand how all these organizations’ work is inter-connected. The final stop of the EIO group was FAO, in Rome. The main goal of the organization is to improve food safety and security for all. To carry out this mission, FAO has a lot of different departments that deal with a specific aspect of food security. Obivously, the department we were most interested in was the Animal Production and Health Division. The biggest part of this division is the Emergency Prevention System for Transboundary Animal and Plant Pests and Diseases (EMPRES). Livestock is a livelihood for people in many parts of the world and EMPRES is the FAO’s way to monitor, control or eradicate of those infections that can severely affect farm animals. Some of the most important diseases tracked are Peste des Petits Ruminants (PPR), African Swine Fever (ASF) and rinderpest. In 2011, the FAO declared that rinderpest had been eradicated (only the 2nd infectious disease to be eradicated – after smallpox), however vigilance must remain to ensure that the disease does not come back or that samples of the virus held in laboratory are safe. Other accomplishments of the FAO include the publication of the Codex Alimentarius, in cooperation with WHO. This is a document that highlights international standards for food safety. As mentioned above, it is frequently used as a reference during trade disputes over food safety at WTO. During our visit, we touched on many other subjects of interests at FAO, from the challenges of antimicrobial-resistant pathogens, the Globally Important Agricultural Heritage Systems (GIAHS) – aiming to promote agriculture while preserving biodiversity – and even the use of insects as an alternative source of nutrition. To conclude, the EIO workshop was a great way to get first-hand knowledge on how all these organizations work together to be one leg of the One Health tripod (symbolized by the Tripartite Concept uniting WHO, FAO and OIE towards a common goal). It was also really interesting to meet the content experts at each site and learn about their role within the larger organization, as well as the advantages and challenges working for each institution. I would definitely recommend this trip for anyone interested global health and international health policies, or for those looking for partnerships with these organizations. A special thanks to the organizers of EIO in Minnesota and Switzerland for their effort, my fellow attendees for the friendships, and the presenters at each organization for their time. It was a great experience! It’s been a great few weeks! I had two great opportunities to expand my knowledge on global health issues. 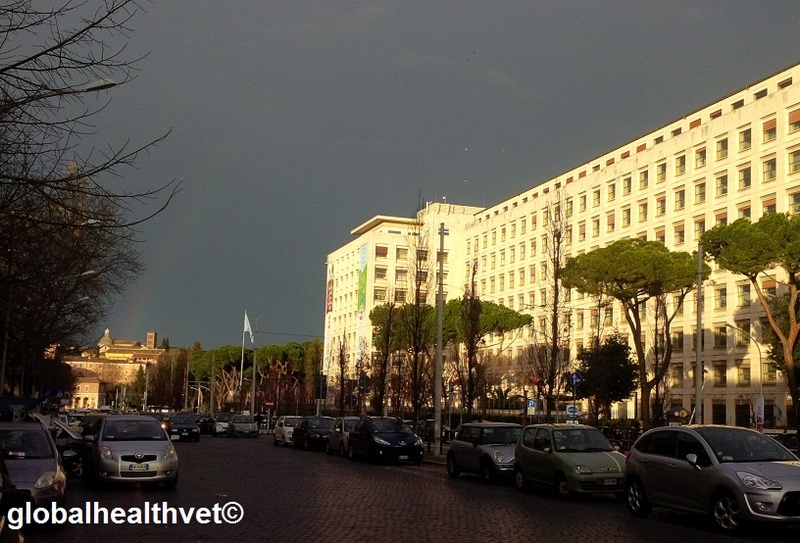 The first was the 3rd International One Health Congress. I was then very lucky to attend a course called Engaging Intergovernmental Organizations where I visited many of the big organizations promoting global health (more on that soon). But first things first…the One Health Congress. 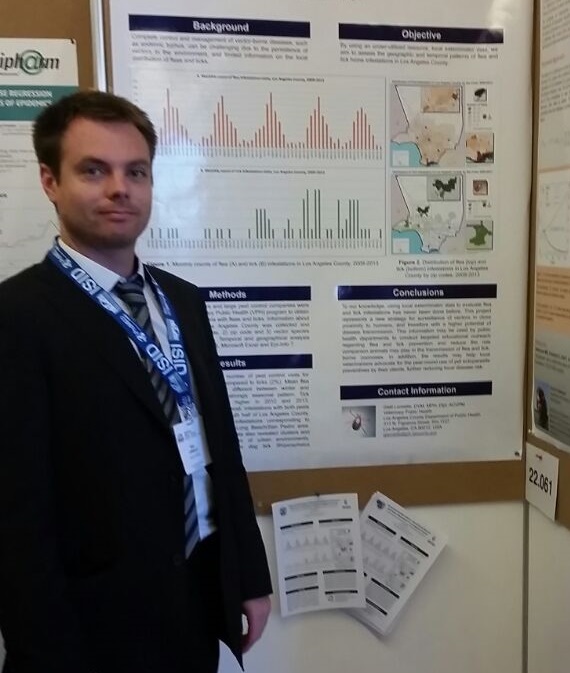 The conference was held in Amsterdam between March 15th and 18th 2015 and I was presenting two posters about the current work I’m involved with about the epidemiology of local animal diseases and flea/tick distribution. I was looking forward to attending this conference because I had the chance to be a presenter at the 1st One Health conference (Click here for report of 1st One Health Congress in 2011). The congress was once again a great forum to exchange ideas, current achievements of One Health and discuss where this movement should be headed. Over 800 participants came from all over the world to share their work in the field. From the sessions I attended, it seemed to me that a majority of them were researchers, university representatives and animal health professionals. 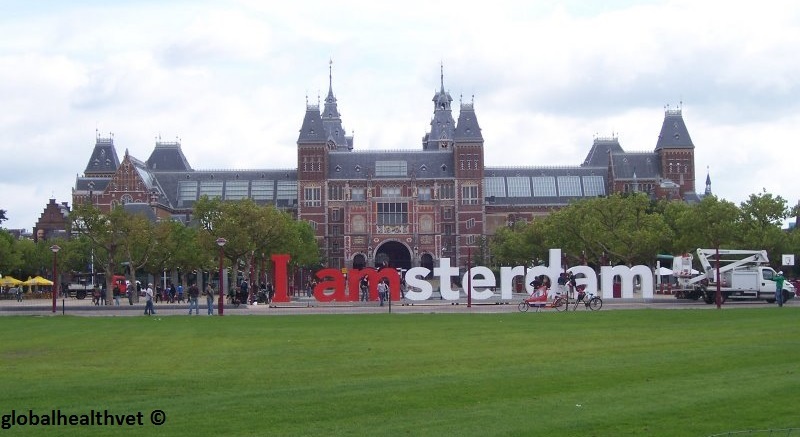 The topics discussed ranged from a recent Q-fever outbreak in the Netherlands, the control of neglected tropical & zoonotic diseases, and the need for more policies supporting the management of problems related to food security and zoonotic diseases. Of course the current Ebola outbreak in West Africa was also a major topic of discussion. A lot of focus was put on bats and their diseases. Many scientists are turning to bats to look for the next big pandemic. Previous studies have shown that bats can host more zoonotic viruses than many other mammals. Some of those viruses fall under the henipavirus family. This group includes Hendra and Nipah viruses and there were great presentations summarizing the discovery of these two pathogens in the past decades. Hendra started to stir up trouble in 1994 in Australia when it infected both horses and the people who cared for them (including veterinarians). Nipah virus is mainly known for 2 different outbreaks, the first one in Malaysia, where pigs were infected and passed on the disease to their handlers. A lot of discussion went into how a bat virus could have infected several pigs and in turn jump to humans. It turns out that, in that case, the pig farming facility was also a fruit plantation and that attracted a lot of fruit bats to the farm – a great environment for viruses to jump species. 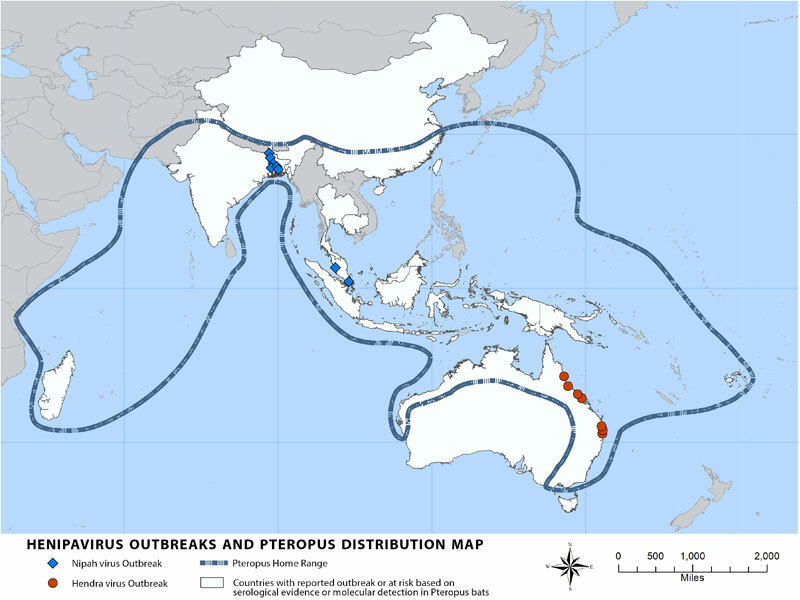 Another Nipah virus outbreak was seen in Bangladesh and was transmitted directly from bats to people through contamination of date palm sap, which is commonly consumed in that region of the world. This is a great example of a low cost intervention that successfully managed this disease locally. Date palm sap is collected from the trees into jars that are left overnight. Fruit bats are also very fond of this drink and would drink from the jar throughout the night. 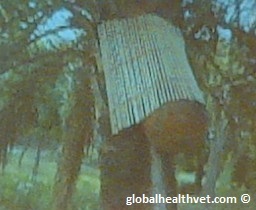 By covering the jars with a layer of bamboo, people were able to prevent the bats from accessing and contaminating the jars. There are several other viruses of importance that can be found in bats: rabies, influenza and coronaviruses (SARS, suspected MERS-CoV) and probably Ebola as well. That being said, bats play a crucial role in the environment and wiping them out (as some propose) would only disturb the ecosystem further and cause unforeseen consequences. So where are we with this whole One Health thing? I greatly enjoyed the conference, and learned tons of good stuff. A lot of the content focused on the “background One Health knowledge” (ex: showing how viruses can cross species barriers or how specific epidemics originated in animals). I left this conference with the same feelings as I did 3 years ago. I still feel that there is much discussion about how One Health would work and not enough practical applications. For One Health to thrive and be understood, we need to demonstrate how resolving the some of the world’s issues from a multi-disciplinary approach result in more long lasting, sustainable and economical change. Don’t get me wrong, I think that the conference participants highlighted some very important topics related to One Health and I think the next step is to put that knowledge into action. I am afraid One Health is becoming more of a catchphrase used to attract attention, and without concrete evidence of its effectiveness, it might not last very long. On the positive side, it was great to see people from all corners of the world show their passion of One Health and it only strengthened my resolve to enact my own practical applications of this concept. Wish me luck! What the what?? Two posts 2 weeks apart? I know, I’m trying to make up for the lack of blog action so far this year. Oh and I went to a pretty interesting conference so I wanted to share. I just came back from the International Meeting on Emerging Infectious Diseases (IMED), held in Vienna Austria and organized by the International Society for Infectious Diseases (ISID). This is the 2nd time that I attend this conference (see post of last year) and this is one of the best One Health-oriented conferences that I’ve attended. It’s really invigorating to learn from those who are at the front lines of One Health. One of the major topic of the conference of course, was Ebola and several speakers presented about their hands-on experience with the current outbreak in West Africa. It was great to hear about the work done in the field, and especially to get a reality-check on the conditions and challenges encountered in this outbreak. As of October 25th 2014, the total number of cases amounts to 10 141 people with the disease, with 4922 deaths. According to a presentation from Médecins Sans Frontières (MSF), the outbreak could have started as soon as December 2013 in rural regions of Sierra Leone before being spread to larger cities from movement of people. On the bright side, it looks like the mortality rate (percent dead from those infected) is lower (60-70%) than previously thought for Zaïre Ebolavirus, which is the deadliest strain of Ebola – and the one responsible for the current outbreak. An interesting aspect of the current Ebola outbreak is the socioeconomic implication caused by the epidemic, which some argue are more deadly than the disease itself. For example, the stigma associated with Ebola cannot be neglected, both on the individual and national level. In fact, this outbreak, located in West Africa, has caused business to decrease with some other African nations, located thousands of kilometers away. One of the most difficult factor to deal with in this epidemic is the local funeral ritual of cleaning the dead. When someone passes away, it is common for members of the family to meet and say their good bye to the deceased, which includes cleaning and even kissing the body. The number of people attending these events can range from 50 to 150 family members, some travelling long distances, and this practice has definitely played a big role in the explosion of the outbreak. Unfortunately, changing cultural belief can be very difficult. For example, some organizations started cremating the dead in hopes of preventing the spread of the virus. Unfortunately, this is not widely accepted and it convinced people not to contact authorities when faced with the possibility of Ebola in their household. Finding control methods that are accepted by the local population is an imperative when dealing with disease outbreaks and unfortunately, the solutions may be difficult to find. Other challenges encountered by the teams in the field include the shutdown of local public health structures, which includes lack of proper infection control or isolation protocols. In countries with the least numbers of doctors per capita, any disruption of the health system can have disastrous consequences. Finally, one presenter touched on the misinformation that plagues the efforts to control the disease in West African countries. There are many outrageous beliefs about Ebola held by some, including that the outbreak is a government scam, and some government officials have even claimed to have stocks of Ebola vaccine and treatment – when in fact there is no such thing yet. In spite of this mountain of challenges, the rate of infected seems to be decreasing, thanks to the enormous effort from both local and international health workers have risked their lives fighting this disease. With Ebola monopolizing the air, it is easy to forget that another disease is also a cause of concern, especially in the Arabian Peninsula: MERS CoV. Contrary to Ebola, this is a virus that was never seen before the 1st case appeared in Saudi Arabia in 2012. It is interesting to revisit this disease at IMED and when I attended the last conference, the disease had been known for only 5 months. Now, 2 years later, cases of MERS CoV are still popping up and the source of the virus remains in questions. Since last year, however, a lot of studies into potential animal reservoirs have been done. Although the true origin of this pathogen remains unknown, the picture has become clearer regarding animal species that could implicated in spreading the virus. Using the lessons from the Severe Acute Respiratory Syndrome (SARS), a previous virus that bears a lot of similarities with MERS, researchers looked into the possibilities that local bats may be harboring the pathogen. Some bats have been found to carry pieces of the virus, in the form of RNA, thus indicating that these animals could play a role in the spread of disease. Attention was also turned on camels. Interesting findings of multiple research projects have shown that camels throughout the Middle East and also parts of Africa possess antibodies against this disease. As such, they were exposed to the disease in the past. One theory is that the virus jumped from bats to camels somewhere in Africa and that the camel trade may have brought the virus to the Arabian Peninsula, where humans became infected. In addition, experimental infection of camels with MERS CoV have shown that the animals became mildly sick but were able to shed large amount of virus from their respiratory tract. However, the fact that only 1/3rd of humans infected with MERS CoV reported having contact with camels leads many to believe that, while camels and bats may be a big part of the MERS puzzle, other factors leading to transmission of the virus to humans must be present. Investigating disease ecology often takes time at it may be a while before we fully understand the dynamics of MERS – after all, only last year did we positively identify the bat origins of the SARS virus, when the outbreak occurred over 10 years ago. Hopefully, even more will be known at next year’s IMED conference. Conferences like IMED are a great way to learn more about the work done by international public health organizations, and it was great to hear about the work done by these groups. I have mentioned EcoHealth Alliance several times in some of my previous posts and representative from this organization spoke at IMED. One of the talks that I thought was interesting was regarding bats as vectors for viral zoonoses. With all the serious diseases potentially by bats (Ebola, SARS CoV, rabies, Hendra & Nipah viruses), a lot of attention has been put on identifying what makes these animals so special when it comes to transmission of diseases to humans. One theory was that bats may carry more viruses compared to other animal species. The work done by EcoHealth Alliance showed that bats themselves do not carry more viruses, however they (along with rodents and primates) do harbor more zoonotic viruses compared to other animals. The World Organization for Animal Health (OIE) presented about their disease mapping system. The OIE gets report of diseases in animals and maps them on their World Animal Health Information System (WAHIS) portal. The information they gather is very detailed and includes: numbers of animals affected, control measures, morbidity and mortality rates and more. 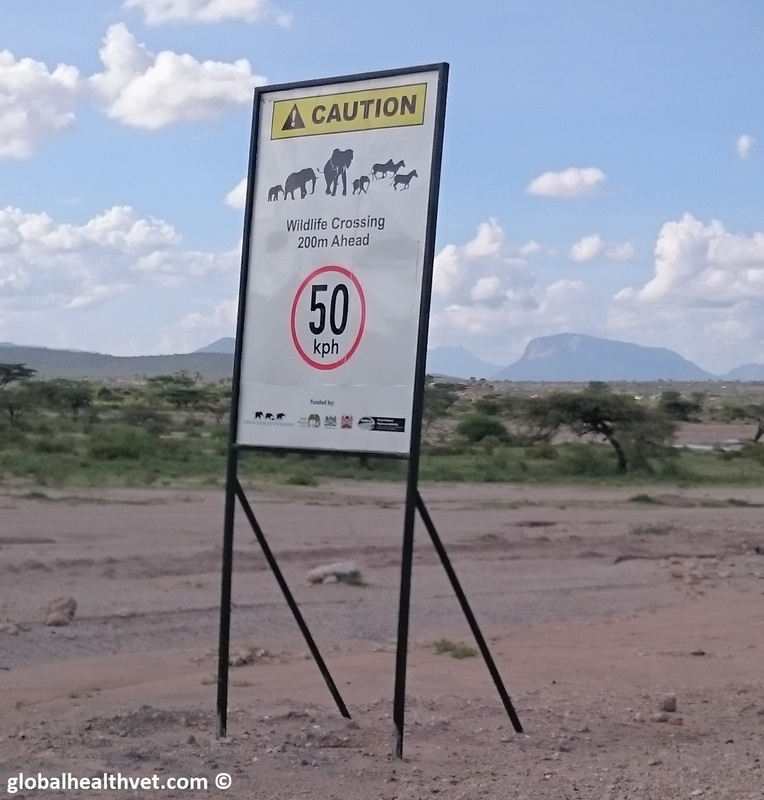 Recently, the OIE started a WAHIS – Wild mapping portal where diseases of wildlife can be monitored. In times where an increasing number of human infections come from animal origins, it is paramount to keep track of diseases in both domestic and wild animals in order to reduce likelihood zoonotic spread. Finally, a presenter the Food and Agriculture Organization of the United Nation (FAO) gave a great presentation on the changing disease landscapes and challenges to improve animal and human health in an ever-changing world. Of course, there were many great talks (and posters) during IMED and I cannot go over all the cool things I learned there…so you’ll just have to go there yourself next time (and maybe I’ll see you there). A long break from posting once again…I’ve been busy studying and taking the examination for the American College of Veterinary Preventive Medicine (ACVPM) certification, which I passed so that’s good news. One thing I’ve wanted to talk about for a while is public health issues associated to importation of animals, more specifically small animals (dogs and cats). The number one risk of moving animals internationally is that they may bring in infectious agents into a new area, where they were not present in the past. If the population in the destination country is not immune to this new pathogen, it could cause significant consequences to the human or animal population, or even agriculture. There are several ways that dogs and cats can cross borders, which include: 1) families moving with their pets, 2) people rescuing animals from overseas, and 3) importation for commercial purposes (especially puppies). Personal pets of people moving internationally are more likely to have seen a veterinarian beforehand. Therefore, they tend to be up to date on their vaccines, anti-parasitic treatments and are generally healthy. Because of this, the risk that they introduce diseases is fairly low. On the other hand, animals that are rescued from other countries are often stray cats or dogs, and thus with higher chances of being exposed to infectious diseases. In 2004, a stray dog was rescued and brought into the US from Thailand and was later found to be rabid. 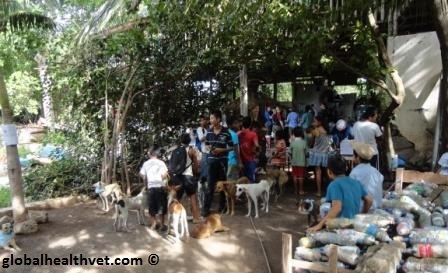 No veterinary checks were done on the animal before the plane ride back and it took several veterinary visits in the US to finally come up with a suspect diagnosis of dog rabies (canine rabies has been eradicated from the US, although bat rabies remain). This incident prompted an international investigation to identify anyone who had been in contact with the sick animal in order to assess their need for lifesaving rabies post-exposure prophylaxis (PEP). Another similar incident occurred in 1987 when a rabid cat was rescued from Mexico and brought into the US. 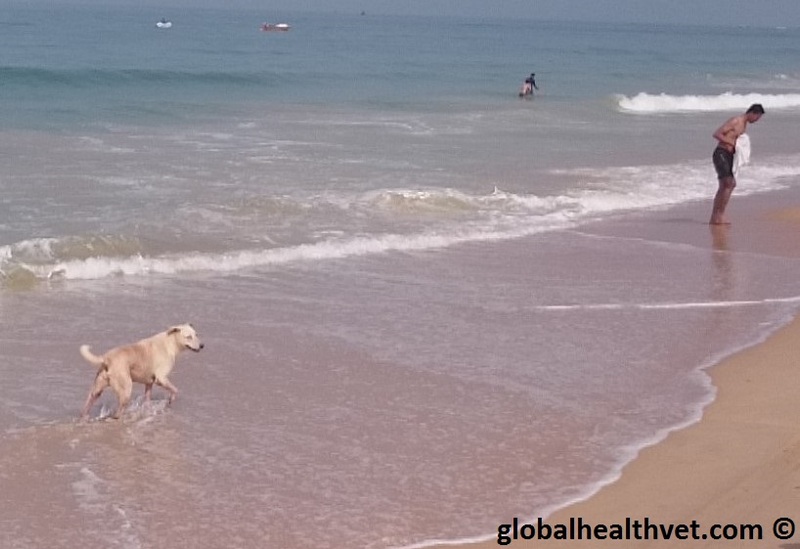 In another example, a dog was rescued from Turkey and brought to Los Angeles, where it was was diagnosed with leishmaniasis (see previous post: Working in Morocco – Recurring leishmaniasis in a canine patient). This is a disease that is not established in Los Angeles and dogs need to be on lifelong treatment to prevent spread. Fortunately, these diseases have not been established in the local population. However, every time a pet travels internationally without proper prior veterinary care and treatment, it is another chance for diseases that can impact both human and animal health to establish themselves in a new area. Have the animal evaluated by a veterinarian in the country of origin. 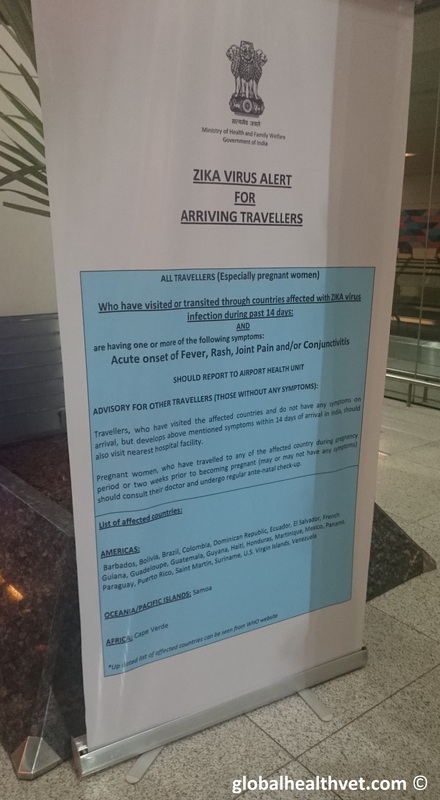 Proper anti- parasitic medications and vaccines (especially rabies) should be given before leaving the country. Once vaccines are given, the pet should wait one month before it can travel. If a veterinarian visit is not possible before the trip, it is of utmost importance to isolate the pet once it enters the destination country. This means the pet should not be adopted out to people until it gets all proper treatments and vaccinations. There should be no contact between the pet and other animals or people before the animal has been cleared by a veterinarian. Until they are out of quarantine, these animals can potentially expose both people and other pets with serious diseases. Veterinarians should consider foreign animal diseases if presented with a sick animal from abroad. Another important aspect of international pet movements is the importation of dogs for commercial purposes. The sale of puppies is a big market in countries like the US, and that has driven some people to establish intensive puppy breeding operations (puppy mills) to quickly supply the increasing demand in specific dog breeds. Doing this in countries with limited regulation regarding small animals allows this industry to escape some of the oversight that exists in the US in regards to pet health and welfare. In the US, the Centers for Disease Control and Prevention (CDC) regulates importations of dogs and cats and these animals should not be imported from rabies-endemic countries until one month after they receive their rabies vaccination (given at 3 months of age). 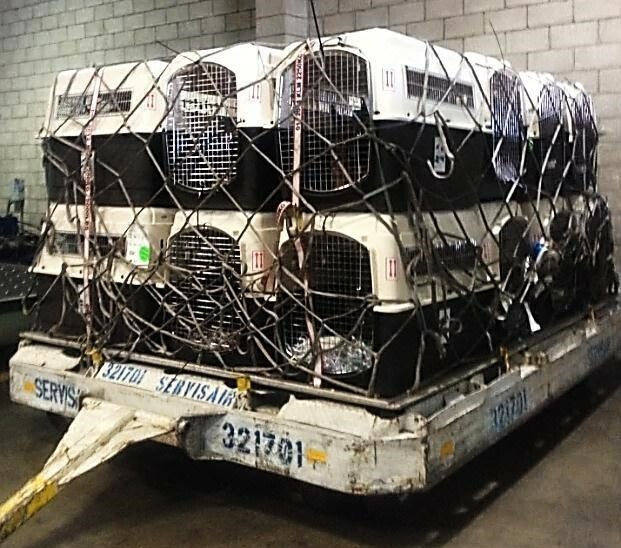 This puts the animals at a minimum of 4 months of age until they can be shipped to the US. Unfortunately, puppies younger than 3 months can be sold at a much higher price (sometimes thousands of dollars per dog) and some importers have falsified the dogs’ documents to state that they are 4 month old in order to comply with import requirements, when in fact they are much younger. Consider adopting animals from their local animal shelter. Most shelters in places like Los Angeles are overcrowded and getting a pet from these shelters can help fight local pet overpopulation rather than bring in more dogs from overseas. If buying from an online source, make sure to visit the animal beforehand to check that the animal is truly local. Buy a puppy from sources licensed by the United States Department of Agriculture (USDA). If a puppy was recently bought online, make sure to bring it to the veterinarian for a health check, vaccine, and to ensure that the puppy’s age based on its teeth matches the document provided by the breeder. 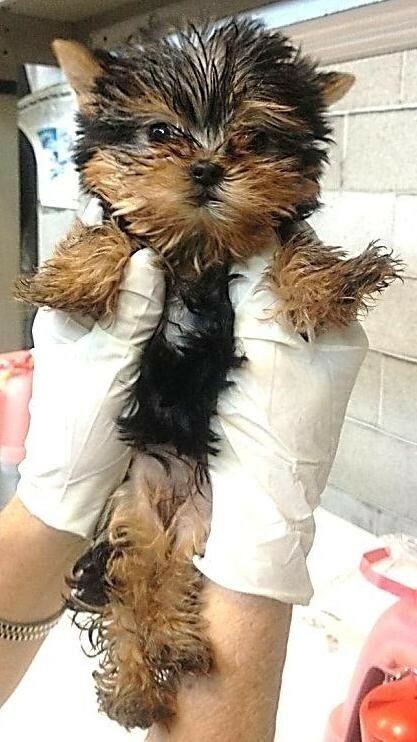 If there is a chance that the puppy came from abroad and it is sick, veterinarians should consider the possibility that the animal is infected with a disease not present locally. 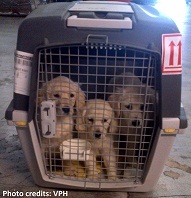 Fortunately, laws have recently been put in place to address the issue of puppy importations. A CDC regulation is in place to refuse shipments of puppies from rabies-endemic countries if they are underage, or with falsified rabies certificates. Likewise, the USDA is increasing its oversight on online puppy retail stores to improve the animals’ conditions. It is easy to think how international travel can spread pathogens globally, especially when it comes to human movements (the current devastating Ebola outbreak reminds us that disease can spread rapidly). However, it is important to remember that animals move across border as well, whether it is from commercial puppy importations, pet rescue efforts, wildlife migration or even through agricultural trade (livestock or food products). In a globalized society, we need to look at population migrations from a One Health perspective (encompassing humans, animals and the environment) in order to effectively anticipate and prevent disease spread. Oh wow…It’s been a while since I wrote something on here, I guess that’s what happens when you become busy with work…in a good way. But not to worry, I have a few topics in mind that I want to post about, one of which is the health benefits associated with pet ownership. In a lot of my posts, I talk about the diseases that can be transmitted between animals and people (zoonoses) or other shared risks, frankly because that’s what interests me the most (I’m a nerd like that…). However as the One Health movement matures, it can explore different aspects of the human-animal-environment interface, such as the human benefits of animal companionship. The positive effects of human contact with animals may not be directly measurable all the time, but what cannot be argued is that the human-animal bond plays an important role in these benefits. Some researchers have started to shed light on some of the ways we can use this relationship to benefit humans and animals alike. Perhaps the strongest evidence of the benefit of human-animal companionship is when we look at two major chronic illnesses affecting humans: cardiovascular disease and obesity. benefits from owning pet. One of the most significant findings from many resources cited in this article is that animal owners have generally lower heart rate and blood pressure compared to others. In addition, when stressed, their heart rates and blood pressures returned to normal faster than in non-pet owners. One study even found that these effects can also be seen when people are exposed to “virtual animals”, through images or videos (so for your own health, click on this link…Doctor’s orders!). There is also evidence that owning a dog can help reduce obesity rates in both people and their pets, generally from increased exercise. This makes sense because most dog owners engage in some sort of activity with their pets, such as jogging or hiking. Even a simple walk with a dog allow dog owners to reach more easily the recommended 30 minutes of exercise per day (for example three 10-min walk per day). One study mentioned in the American Heart Association article found that dog owners walked on average 300 minutes per week, compared to an 168 minutes in non-dog owners. 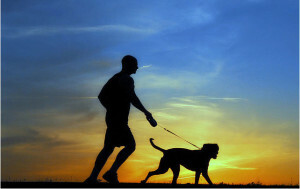 The authors also added that the dog was the primary motivator for walking. In addition to being more likely to engage in daily exercise, people who own dogs and walk them around their neighborhoods have more chances to interact and socialize with others in their communities. Knowing your neighbor can come very handy in the case of an emergency. This idea is called community resilience and is an integral part of preparing for disasters. Indeed, should a major disaster occur, many response teams will be overwhelmed with helping people and it may take a significant amount of time for them to get to everyone and make sure that they are safe. In fact, a community is more likely to fare handle emergencies better if they know and can rely on each other for survival. This is one aspect of One Health I am not too familiar with but researching the subject a little bit, I found that the examples particularly moving. 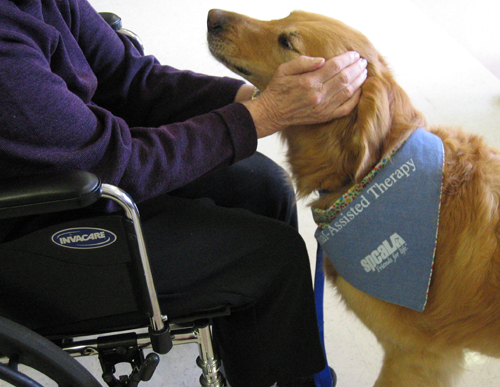 An article published in 2009 summarizes some of the experiences in animal-assisted therapy (AAT), especially in regards to dealing with children. For example, animals reduce anxiety during therapy sessions. In spite of the potential diseases animals and people can share, there are many benefits of owning pets and I cannot cover them all in a single blog post so I encourage readers to research more positive facts of pet ownership. In fact, responsible owners who provide their pets with appropriate care dramatically reduce the chances of being infected by a zoonotic disease. This means keeping dogs and cats up to date on their vaccines and make sure they see a vet once a year. Association for Pet Obesity Prevention – Big Pets Get Bigger: Latest Survey Shows Dog and Cat Obesity Epidemic Expanding. Nijland ML. 2010. Overweight in dogs, but not in cats, is related to overweight in their owners. Public Health Nutrition. I wrote in a previous post about my experience with a rural volunteer veterinary clinic on Ometepe Island, Nicaragua. This initiative was organized by veterinary students from the local International Veterinary Student Association (IVSA) chapter of Oregon State University, and provided great insight on working in rural areas of a developing country for both the students and veterinarians who attended. One important aspect that working in this environment brings forth is the opportunity to gain experience with diseases rarely seen in other countries. One such disease that was omnipresent on Ometepe Island was Ehrlichiosis, which is definitely of public health importance as it can infect both animals and humans. This is a great example of a vector-borne disease, in which the infection is transmitted from person to person (or animal to animal) by a vector, usually an arthropod like a mosquito or tick. Our patient was a young female dog that was brought up to the clinic for wellness care and inappetence. On physical examination, the patient was dehydrated, weak, emaciated and infested with ticks, especially around the ears. A more thorough examination revealed that all lymph nodes palpated were enlarged and that the dog was anemic as well. Diagnosis of Ehrlichia was made by using an antigen SNAP test that allows us to look for other types of infections, such as heartworm and Lyme disease. 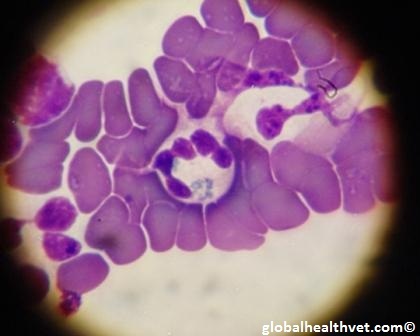 Every patient seen at the clinic also had blood drawn to look for Ehrlichia microscopically and also assess platelet numbers for potential surgery and, in this dog, visual identification of the organism in a neutrophil confirmed the diagnosis. 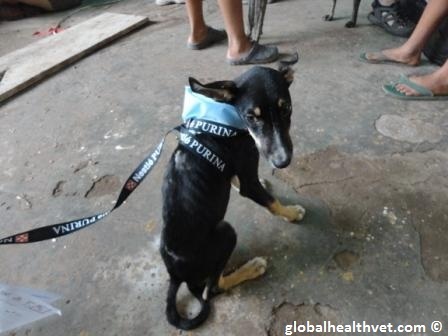 Due to the severe emaciation and anemia, our patient did not go to surgery for sterilization and an antibiotic regimen consisting of doxycycline was started. 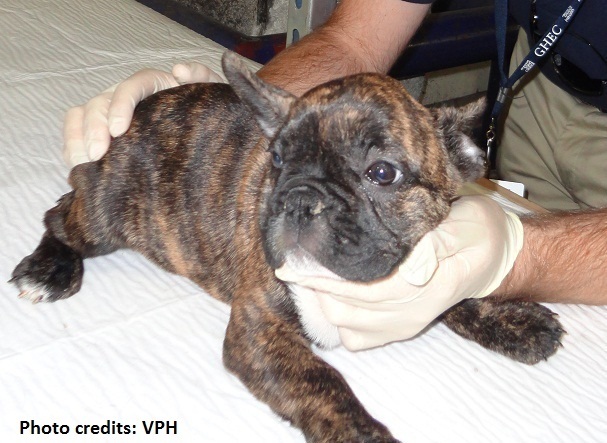 In addition to antibiotics, the owner was given 6 months’ supply of flea and tick medications. Ehrlichiosis can be caused by a variety of parasites of the Ehrlichia or Anaplasma families. 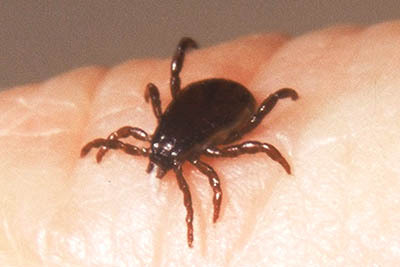 Several of these can cause infection in both animals and people and all of them are transmitted through the bite of a tick vector. The type of ticks that can transmit ehrlichiosis varies depending on geography but most common vectors include the brown dog tick (Rhipicephalus sanguineus) or other ticks from the Amblyomma or Ixodes species. In dogs, ehrlichiosis is commonly caused by Ehrlichia chaffeensis, E. canis and E. ewingii. These can affect several body systems and clinical signs include fever and enlarged lymph nodes (lymphadenopathy), however, polyarthritis, conjunctivitis, thrombocytopenia and hepatosplenomegaly can also occur. It is important to remember that other animals such as horses, cattle, sheep and even cats can also be infected by other Ehrlichia or Anaplasma. Human ehrlichiosis can be caused by several of the same species of Erhlichia known to infect animals, including E. canis, E. ewingii and E. chaffeensis. In people, it appears that E. chaffeensis can cause somewhat of a more severe infection. Humans, just like animals, are infected through the bite of a tick and the disease can be characterized by fever, muscle ache, respiratory and neurologic problems such as ataxia and meningitis. This disease highlights the risk posed by vectors like ticks that can infect animals as well as people. Vector-borne infections give us the chance to look at a true One Health paradigm for disease. Indeed, these infections cause disease in both humans and animals and the distribution of vectors like ticks (but also mosquitoes) is largely dependent on the environment. In fact, simply treating our canine patient for ehrlichiosis on Ometepe Island would have gotten the current infection under control. However, in a setting where ticks are very prevalent, it would be a mistake to forget about environmental factors that lead to infection in the first place. 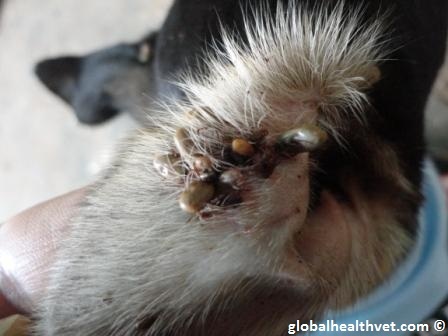 This is the reason why we gave as much topical preventive medication against ticks and fleas as we could with the hopes of reducing the number of ticks climbing on, and thus re-infecting, dogs. In a perfect world, the house and the environment where the animals (and people) live should also be treated to make sure ticks don’t thrive there. Ehrlichiosis is just one example of a disease transmitted by vectors such as ticks and there are many others. Perhaps the most famous one is Lyme disease, which is present in both North America and Europe, however, different diseases can occur in different parts of the world. The Centers for Disease Control and Prevention (CDC) has a great list of which tick-borne disease are present in the USA as well as in other countries. One of the great misconceptions about ticks is that people are only exposed when they go into nature, when hiking for example. While it is true that most tick species are usually present in the wild, some species, like the brown dog tick (Rhipicephalus sanguineus) are known to establish themselves in houses and can cause some pretty severe infestations in people’s homes (one female tick can lay at least 2000 eggs in the environment…or in someone’s house). 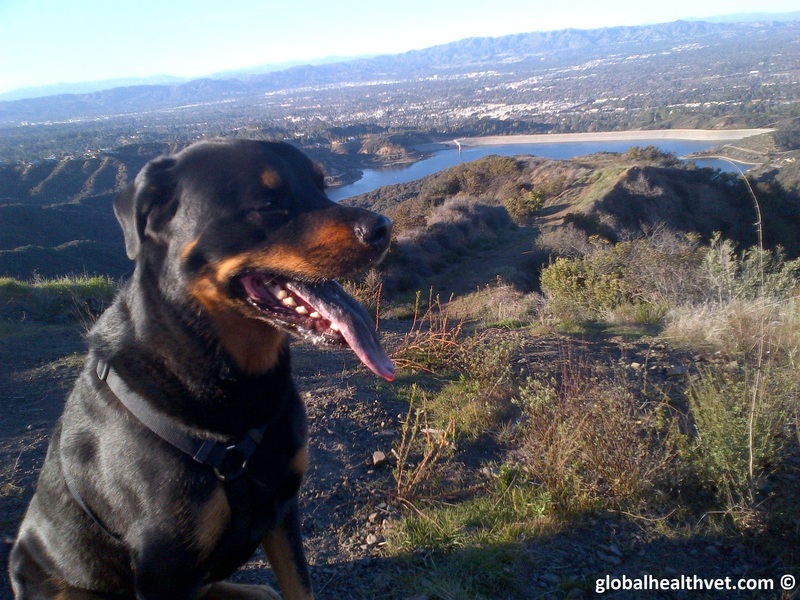 This is why pets should always be on flea/tick preventives, even if they don’t usually go hiking with their owners. People who notice ticks in their homes should call exterminators to help treat the infestation. Furthermore, it is recommended that those who go hiking wear long pants and sleeves and check themselves for ticks after the hike. Finally, I would like to, once again, remind readers about the effect of a changing environment on the distribution of vector-borne diseases. Global weather changes can cause higher temperatures and humidity, which leads to an increase in the number of vectors, but also their range. I have touched on that in a previous post, specifically regarding mosquitoes. However, ticks also benefit from these weather changes. A recent study has shown that due to higher average temperatures, Norwegian ticks can now be found in places where they traditionally did not exist. Rabinowitz PM & Conti LA. 2010. Human-Animal Medicine. Saunders Elseviers ed. I just had the opportunity to attend to the International Meeting on Emerging Infections (IMED), held in Vienna, Austria where I presented a poster on West Nile Virus (WNV) surveillance efforts in Southern California (click here to read my previous post on WNV monitoring in wild birds). 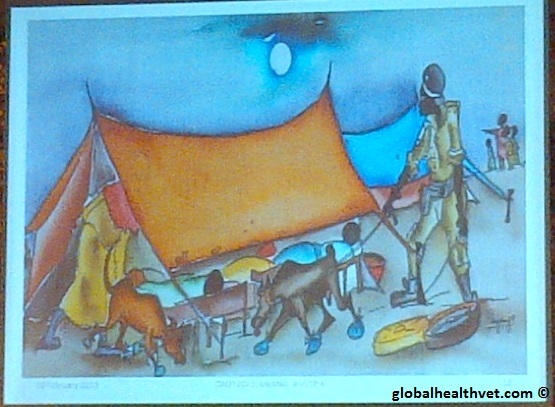 Ugandan artist’s rendition of the Ebola outbreak presented at the conference by a speaker from South Africa. The event united over 700 visitors from 99 different countries and presenters shared their experiences and findings on various issues regarding infectious diseases in both animals and people. One of the themes that was highlighted across the board was the need for an appropriate educational component when fighting emerging infections, especially in developing countries. Viruses like Ebola for example, that can cause severe disease in those affected, can be transmitted from animals to humans, or between people, due to specific habits that are practiced in areas at-risk. Ebola is present in wildlife and several outbreaks in Equatorial Africa have been associated with hunting and consuming primate meat. As the animal is hunted and prepared for food, the virus, found in the primate’s blood, can enter the hunter’s body through scratches or wounds. However, the virus is also shed in the saliva and secretions and contact with these fluids is the main way that this disease spreads to others once an outbreak has started. This is why attending the sick without proper personal protective equipment can cause transmission of the disease. Unfortunately, Ebola is often fatal and family members or friends who prepare the body for burial can also become infected by such activities. The speaker of this particular presentation emphasized on cooperation with local leaders in order to increase efficacy of control measures. One such example was apparent when the presenter discussed traditional Muslim habits of preparing a body for burial, which has to be done in a certain way but can expose people to the virus. One crucial step in implementing intervention methods was to meet with higher Muslim leaders in the region as they only could grant exceptions to these burial practices once they understood the circumstances. This is a perfect example of how trying to manage outbreaks in any country without taking into consideration the local culture can fail, even if responders have all the appropriate medical tools at their disposal. A lot of great work is done by USAID in Equatorial Africa in order to understand the drivers for emerging diseases like Ebola. Covering jars collecting date palm sap is a simple and effective way to prevent contamination from fruit bat urine and therefore, human transmission of Nipah, as described by this presenter from Bangladesh. Another clear example of how human practices can affect disease dynamics is Nipah in South East Asia. This is a virus that can affect both animals, such as pigs, and humans and is shed by fruit bats from their saliva and urine. Just like Ebola, Nipah can cause grave disease in populations exposed. It was striking to see various presenters talk about their different experiences dealing with this disease and how neighboring countries can have big effect on the number of people affected because of the smallest changes in habits. As an example, in Bangladesh, the disease is concentrated in what is called the “Nipah Belt” and researchers have spent time looking at what are some of the causes for this increased presence of Nipah in this region. One of the most important factor was the consumption of raw date palm sap. In order to collect this delicacy, a shaved area on the tree trunk is made and a jar collects the sap. As it turns out, fruit bats are also fond of the juice and will drink from the jar, contaminating it with their urine or saliva. In neighboring countries such as Thailand, raw date palm sap is not as commonly consumed, and villagers also cover the collecting jars more frequently, leading to a reduced likelihood of transmission of Nipah. It is amazing to see how small interventions at the local level can greatly affect the life cycle of a disease and save lives. Another risk factor for the transmission of Nipah to people is forest fragmentation, leading to increased contact between bats and people. One Health teaches us that the interactions between humans and our environment can greatly promote zoonotic transmission of disease, or even the apparition of new pathogens. Some of the presenters shared hard evidence of this relationship between health and the environment. A significant focus was put on some of the issues that can arise from loss of biodiversity. One may think that a decreasing number of wild animals may mean reduce chances of transmission of zoonoses. However, some researchers presenting at IMED advocated that biodiversity plays the role of a buffer for disease and in effect dilutes pathogens across multiple species rather than concentrating them into a few species, which we can then enter in contact with. Similarly, loss of animal diversity and specifically predators can lead to an increased number of prey species that can be considered as pests such as rats, which can transmit diseases like plague. Finally, we were reminded of some of the challenges that promoting public health and preventing diseases can generate. As one presenter suggested, successes with disease prevention result in lack of illness, and therefore, it can be difficult for policy makers and the public to see the benefits of such programs. This is why it is important to maintain infectious disease prevention projects existent or we will likely face a come-back of some major infections that were controlled, and as such invisible, in the past while these programs were in place. Overall this was a very interesting conference and I think participants were exposed to a lot of different challenges in disease prevention, but also new tools and ideas that can help us meet and overcome these challenges. I left Vienna with a new sense of motivation and I can only hope to attend the next IMED conference, held in April 2014 in beautiful Cape Town, South Africa. Quick visit of beautiful Vienna…The Schönbrunn park, hunting grounds of the Kaiser where we can find the Gloriette, a ballroom built in 1775.